Deerey me! : the teapots are taking over the asylum! This is my last week in proper paid employment. Last week saw my 16th anniversary in my current job and this Wednesday will be my last day. The Government announced we were closing soon after the last election and I have been anticipating my redundancy ever since. Sometimes it seems like a long time coming, and other times the years feel like they have flown by. 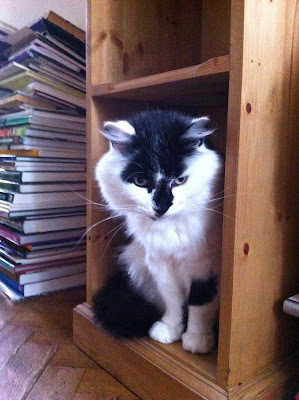 I had said I would give myself the Easter weekend off before starting to sort out the house and decorate, but I am going to need Mark's help to move the bookcases (God bless Ikea!) in the dining room and take up the carpet - which means we need to be doing this while he is off work next weekend. In preparation I have been gradually moving fabric upstairs and books in to the hallway and living room...along with those teapots that had been secretly breeding in the dining room (the ones on the shelves in the living room are far more restrained...or perhaps constrained). 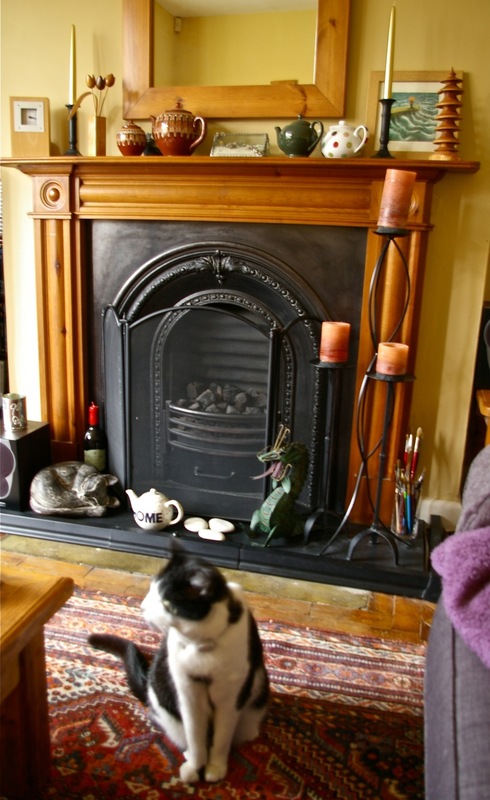 I try very hard to keep the living room our one calm and clutter free space in the house (not easy given that Mark and I each had a house when we got together and had each accumulated many bits and pieces over the years and have had to squish two households in to one house). However, I rather like the Bulgarian drip glaze teapot and sugar bowl on the mantelpiece; perhaps they could stay there without risking upsetting the zen too much. It is hard to believe that we have already had a major clear-out of books. Admittedly it has been mainly paperback fiction that went to the stall in the Guild Hall Market or to charity shops when we got our kindles, but I did also have a bit of a weed of cookery books too. I think I may have to be a bit tougher! The cats have enjoyed nosing in to recently cleared spaces and finding new places to sleep. Actually Max was a bit off colour at the end of the week and was refusing to eat. He has to have special food for his urinary tract problems, but even when I tried to tempt him with a little roast chicken or tiny bit of cheese he wouldn't even sniff it. When last year Rio was similarly off colour he started getting liver problems very quickly from not eating and had a few days at the veterinary hospital, so I rushed Max in to the vet to see if we could avoid that for him. The vet thought he might be getting over an infection and had got out of the habit of eating so gave him an appetite stimulant, and by the time I got him home he was meowing for food...and ate 2 1/2 dinners! 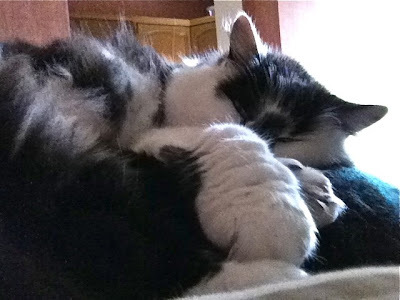 We have been keeping an eye on him, but thankfully he seems to be back to his old, furry, purry self. So roll on my last few days at work so my new life can start - and I can get my teeth in to wallpaper stripping (not literally!) and turn the dining room in to an organised and beautiful workroom...that can still be a dining room when necessary. I know it is rather sad, but I am already looking forward to arranging my fabrics by colour and revisiting books as I return them to the shelves or let them go to new homes. What can I say, I like things to be orderly! Books are like rabbits - they breed when you are not looking! But then again, a house full of books is very welcoming in my opinion. I'm looking forward to seeing all the changes later this year! 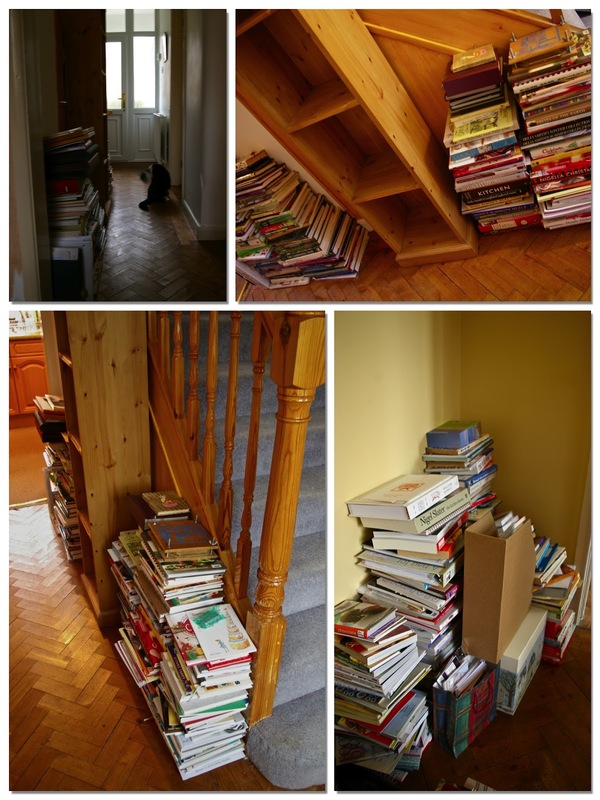 I do enjoy a house full of books, but there also needs to be space for people. Come the Summer, the house will be beautiful! Yup, books breed in this house too. The teapots haven't though ... yet! Thanks Annie - my last day today was a bit odd, but I am so looking forward to the next step; it feels like a bit of an adventure!